This basket is made to order, please call Toll Free 1-877-317-6767 to discuss contents and budget. 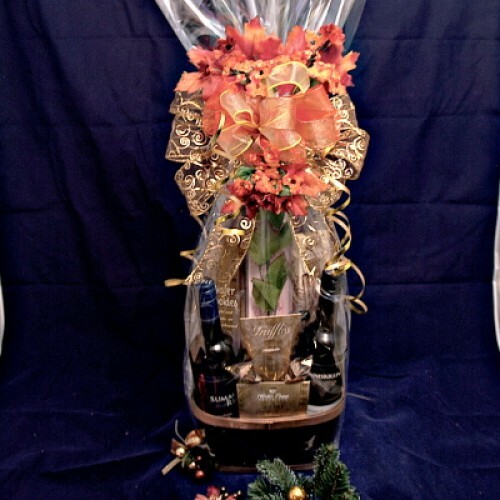 Can include all the favorites, with no limit to what we can add into this basket. From a full FRESH (ham, chicken, steak) meal in a basket, to fruit and vegetables (seasonally chosen) to snacks and goodies. Even Bouquets of fresh flowers, or a flowering live plant. You name it, we will get it. Customize your own Basket by setting a budget, then giving information of what you would like to see in the basket. From savory to sweet, fruit to gardening, a custom basket always hits home for the recipient, as you know them best, and what they like and dislike. Can ask for any kind of items to be put into the basket as we will go find it if we do not have it.